X is for Xtra refreshing PANHA. After a bit of a break, we arrive at another wild-card letter: the mysterious "X". These wild card letters give me a chance to come back to some beloved foods that I somehow missed out on during our journey. This time, while wondering what food to make for "X", I thought about all the foods I made from A to W. We have tried many rice dishes, vegetables and dals, even a condiment or two. One category that is conspicuous by its absence is beverages. We cannot do a whole series on Marathi food without touching on this important class of "not-quite-food foods"! Most of India has three seasons: hot, hotter and hottest; a constant intake of water and beverages is required to keep your cool in this kind of weather. At the height of summer, the mercury is off the charts, vapor rises off the boiling streets and people are overcome with fatigue and lethargy. A cool drink at this time is just the thing one needs. The most popular beverage is, somewhat counter-intuitively, drunk piping hot: chaha or chai, strong black tea with milk and sugar. Among the cold beverages, the most popular are syrups of various fruits, collectively called sarbat. The easiest one to make is limbu sarbat, by mixing some sugar and salt into lemon juice and diluting it with ice-cold water. Yes, unlike in the US, Indian lemonade always contains a hefty pinch of salt, I think this is to replace the electrolytes that the body loses due to constant sweating. Other popular "sarbats" are made with the kokum fruit and mango pulp. 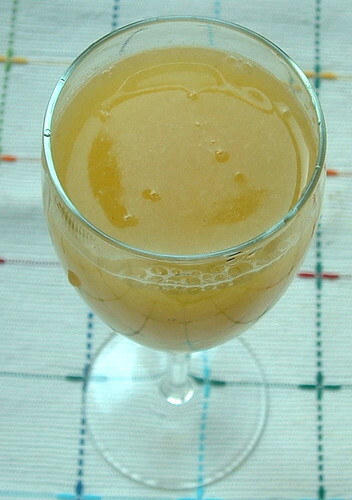 Generally, store-bought bottles of the syrup are stocked in the home, so that a drink can be mixed up at a moment's notice. Milk-based drinks are also very popular, including simple milk-shakes made by blending fruit pulp with some milk and sugar (mango and chikoo are my personal favorites), and cold coffee made with instant coffee. A wonderful savory drink is called mattha, made by blending yogurt with ginger, salt, coriander powder and cumin seeds. Another favorite milk-based drink is called masala dudh or masala milk, made by adding a mixture of ground nuts and spices into milk, and this can be enjoyed hot or cold. If you happen to be outside, a delicious drink that is often available for a few rupees is oosacha ras or fresh sugarcane juice. Much of Maharashtra is coastal, which means that coconuts are available a-plenty...street corners and beaches are homes to vendors selling naaral pani or tender coconut water. For today's letter, I chose my favorite Marathi beverage: panha, a drink made with raw mangoes. As the seasons inch towards the height of summer, around early April, the mango starts making its appearance in the bhaji mandai or vegetable market. If one is lucky, there will be a tree in your backyard so you never have to buy these. Raw mangoes are prized for many seasonal delights, both sweet and savory. Panha is made by cooking chopped raw mangoes with some jaggery (sugar can also be used). The cooked pulp is mashed, seasoned with some salt and cardamom powder and mixed with ice-cold water to make a delicious and refreshing drink. Traditionally, panha is served at many afternoon events during the summer months, the heat during that time makes the thought of hot tea pretty much unbearable! On these occasions, panha is paired with a savory snack called vatali dal, made by grinding together soaked chana dal and grated raw mangoes with some chillies and salt. This dal-panha combo is just a fantastic treat and somehow makes even the harsh summer months worth looking forward to! 1. In a saucepan, combine chopped raw mango, jaggery, salt and 1/2 cup water. It does not matter if the jaggery is a large chunk, it will dissolve on boiling. Boil the mixture and simmer for 20-25 minutes or until the mango is soft and falling apart and the jaggery has fully dissolved. 2. Using a blender or food processor, grind the mango mixture to a fine pulp. 3. Strain the pulp to remove any fibers and chunky pieces. Stir in the cardamom powder. 4. Dilute the pulp with chilled water to make the panha. Enjoy! This quantity of jaggery makes a fairly tart panha (which is how I like it). Do taste the pulp to adjust the sweetness to your taste. It may also vary depending on the tartness of the mango. If you own a pressure cooker, mangoes can be cooked whole in the pressure cooker, then peeled and pulped and mixed with melted jaggery. We shall meet very soon for the "Y" of Marathi food. Any ideas for this one? Thanks for sharing this recipe...I was looking for one. The best oosacha ras I drank was at Laxmi Market in Pune. Awesome with a double capital A.
Super refreshing. I love anything mango as itz my fav fruit. Thanx for marvelous recipe. Panha and Vatali Dal makes me nostalgic about all the 'Haldi-Kunkoos' that I have accompanied my mother to as a child. The smell that immediately fills my nostrils is of the rose water sprayed from a silver 'Attardaani'. I am sure you too have similar memories. Now, 'Y' is somewhat difficult. I don't think of anything. Maybe something with Yam (Suran)? Or you can take this one too as a wild card and make something that you love and name it 'Yummy ------'. By the way, Spicehut, it's 'Laxmi Road'. Sorry, I couldn't stop myself from correcting you. I am a die-hard Punekar, you see. I meant Panha and Vatali Dal as a combination and considered it as one. That's why 'makes'. It wasn't meant to be a grammatical mistake. Simple luv your A-Z of marati cuisine. Mango panha is one of my fav drink. We used to make bottles of it and refrigerate it. I guess it stays good for at least a week in the fridge. I had learnt this recipe from some tv show and always thought it was from north India. Never knew it is from Maharhstra. Nupur..you are so committed! just Y and Z to go. What a great job! I've never had this... but my husband keeps raving about it. I saw raw mangoes at the grocery store the other day and with your recipe, no more excuses not to try it! This really speaks of summer to me-yum. I adore mangos. Have you seen those newish mango slicers from OXO? I was wondering if they actually work. I always wind up wasting a bit when I peel and cut them, no matter how careful I am. On the other hand, I wouldn't want to forgo the "cook's priviledge" of slurping up what is stuck on the seed! I recently had Mango Lassi at an Indian restraunt, and fell in love with it. How would I go about making it at home. Is it as simple as yogurt and mangos blended together? Any body has any Panha recipes from applesauce? I recently had some and the first thing it reminded me of was 'panha'. Green mangoes 'kairi' of the right tartness is often hard to find in the US. this is Swamini from India- Mumbai. i m happy that u have such an informative n amazing site. i also appreciate u effort of promoting our culture there. carry on. kasla sahee dista ahey panha....tondala pani sutla!! In Sindh, it is called Kairey ka raas. A raw mango is taken and placed in hot ashes till it becomes a pulp. Squeeze the pulp out of the skin with your hands in a muslin cloth. Add sugar and iced water - and Ho Jamalo! Well, I had Aam ka Panha last week, after almost 45 years. All I remembered was how it tasted, when we used to have it before dinner at my Uncle's place in New Delhi, when we used to visit them every summer. Sitting out in the lawn, just before dinner, Ice cold panha was served. Gosh, my jaw muscles tighten up just thinking of the taste. Here is the quick recepe I used to make it last week. It was like reverse engineering. Following the taste to the ingredients and processing. I baked two green mangos in a convection oven, pealed its peal after it cooled down. mashed it and put water, sugar, and black salt, and dried, crushed mint leaves. And violah !!! It remined me those summer evenings at my Uncles place, even after over 45 years, it still had that great taste. Did you know, you can also make Imli (Tamerind) ka panha !!! OOOOh!!! It is soooo good !!! Thanks for sharing - I've been wanting to make this ever since I had it in a flight recently. And no, I'm not writing to ask you what the yellow drink is! lol! I love panha. Thanks for sharing the recipe. Book marked. hi this is a lovely blog with simple tasty recipes. really remember my granny making all these recipes/ panha is the ultimate refreshing drink for summer, thankyou and keep it up!!! !